Ha ha ha ha! Ha ha! Ha! You made a joke about Splendor! It’s funny because you think Splendor is boring even though a lot of people really like it! Wha hahaha ha! Wha ha ha ha! Ha! I can’t stop! Seriously, you gotta help me, I can’t stop laughing! Who it’s not for: Those looking for a heavy combat game, a heavy economics game, or a high-risk game. You know that game everyone loves, with the chips and the gems? Splendor, yeah that’s the one. Well, some people love it, and some people feel that while it’s an okay game system, there’s not a ton of substance there to make it… y’know… fun. It’s like an exercise in efficiency. Who likes exercise? Not me. Well the same guy made another game. 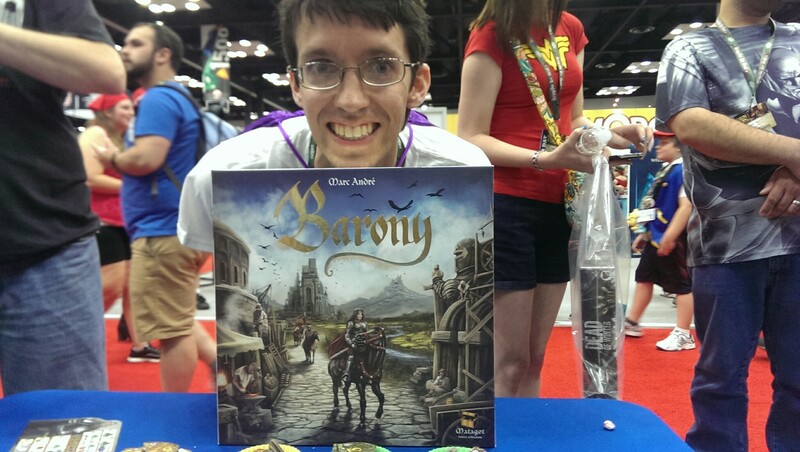 It’s called Barony, and it’s another action-efficient game, but this time you’re building villages and castles and hiring knights on a big ol’ map, and honestly that makes it way more fun to play. The goal of Barony is still to score the most points more efficiently than everyone else, but you do so by building up your kingdom. You start with three cities and three knights (at least we did in the demo. I’m not sure if three is the real starting number or just to move the game along). Each turn you get one action. You can move knights, add more knights, use knights to build villages or… um… fortresses (that’s not what they’re called but… it’s all icons so I can’t remember. 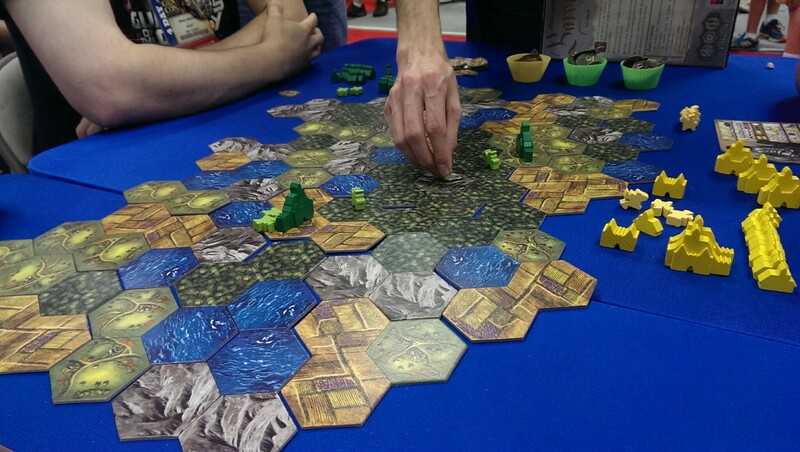 Darn), use villages to build Cities, and… trade in your points. You can attack other players’ knights and villages by moving MORE Knights into their spaces, although mountains are very defensive and multiple tokens also defend against attacks. Villages must be defended then, because building them awards you points but those points can be taken away if you haven’t traded them in yet. At least you get those two fortress-thingies which are like villages (they get you points) but are defensible. Cities! Cities springing up everywhere! Once players kinda know what they’re doing, the game clips along. Like Ascending Empires without the flicking, action efficiency is key here but you only get to do one thing at a time, and you should be able to figure out that thing while the other players are taking their turns. Players can keep to their corners and play for efficiency, or they can play aggressively with plenty of attacking and blocking and general getting in each other’s way. Not enough to derail the game, and since one action happens at a time you can usually see an attack coming and either take steps to defend or just ignore it and do other stuff. 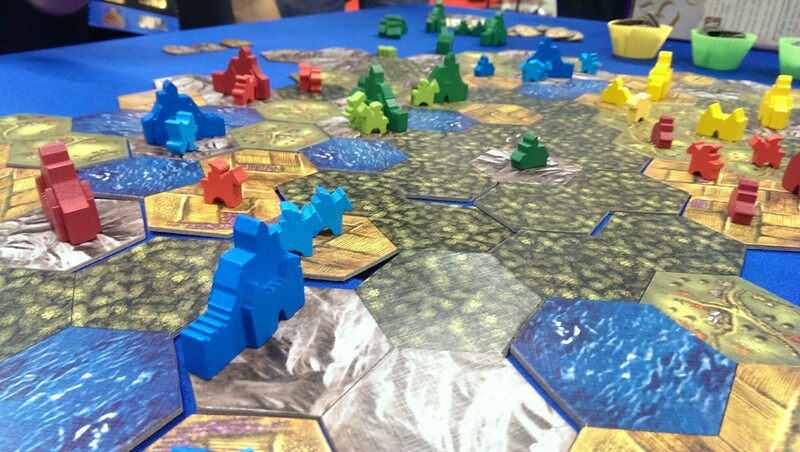 The wooden tokens are pretty neat, with a bit more detail than you usually see, and the board tiles are colorful, so that adds a further element of fun.